Antique c1870s quilt measuring 86 inches by 88 inches. 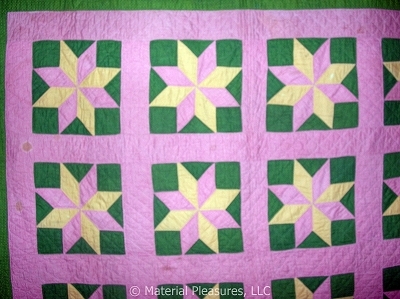 Pattern is a Star of LeMoyne, also known as a Puritan Star, Idaho Star and Eastern Star. There are 16 blocks (arranged 4 across by 4 down), set straight, measuring about 12 inches by 12 inches. There is a 3.5" double pink sashing, and 1 border: 11.5" to 12" wide double green print. It is pieced by hand, and hand quilted in a grid in the sashing, to the piece in the stars, and cables in the border. The backing is a pieced Bars Back or Strippy Back in double pink and bright blue. I have had this quilt for awhile and that blue fabric always bothered me, it seemed 20th century to me, where as the rest of the quilt: the green, the pink, and the cheddar, are definitely 1870s. Upon closer inspection I now believe the blue bars are a conservation effort. They are hand applied onto the back, and is covering another light with blue fabric. It is somewhat quilted, in wide straight diagonal lines, that do not match the quilting on the top. I have not tried to remove it to see what is underneath. There is also a small hand written note attached to the quilt, written in ink. Condition is good. There are a few spots and some color loss in the green fabric. Please click on Image Gallery to see additional pictures.